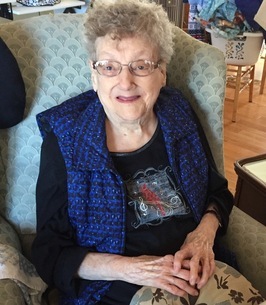 Passed away peacefully, with her family by her side, at the Thessalon Hospital on November 8, 2018. 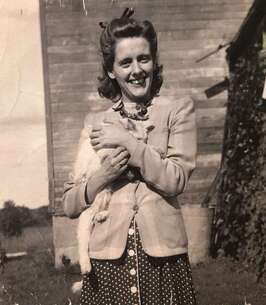 Beloved wife and best friend of the late James Smithers for 69 years. Madeline was in her 97th year. Daughter of the late Eva May North and Hugh Wills of Thedford, Ontario. Dear sister to the late Fred ( Jennie ) Wills of Trenton and Aunt to the late Gary Wills. Loving mother of Gail ( late John Lawrence ) of Bruce Mines, Randy ( Barbara ) of Stratford and Heather ( Frank O’Neill ) of Bruce Mines. Loving Grammie of Lorna and Wayne Smith of Alberta, Kari and Troy Golden of Bruce Mines, Faye and Dwayne Smith of Alberta, Scott and Kelli Smithers of Oxford Mills, Stacey and Fergie Cooke of Toronto, Sarah and David Gilhooly of Stratford, Amy and Lonnie Patenaude of Fergus, Abigail and Karim El Ramady of Mississauga and Andrea and Andrew McIntyre of Orangeville. Great Grammie of Kayla, Karlyle, Caleb, Maddy, Owen, Ellie, Miles, Delaney, Clayton, Josie, Sophia, Olivier and Isabella. Also survived by many nieces and nephews in the London area. Mom loved London and spent many years working at the United Cigar Store at the corner of Richmond and Dundas Streets. A service will be held at the Beggs Funeral Home, Thessalon on Tuesday November 13, 2018 at 1pm. A special thank you to the Thessalon Hospital for caring for Mom and looking after her so well. To plant a tree in memory of Madeline Orilla Smithers (Wills), please visit our Heartfelt Sympathies Store. A service honouring the life of Madeline Smithers will be held at the Beggs Funeral Home, Thessalon on Tuesday November 13, 2018 at 1pm. We encourage you to share any memorable photos or stories about Madeline. All tributes placed on and purchased through this memorial website will remain on in perpetuity for future generations.